The road to ambassador from companion may be a telling one... and difficult to travel. LELIANA: I want to know who pines for our Commander. We can use this to our advantage. 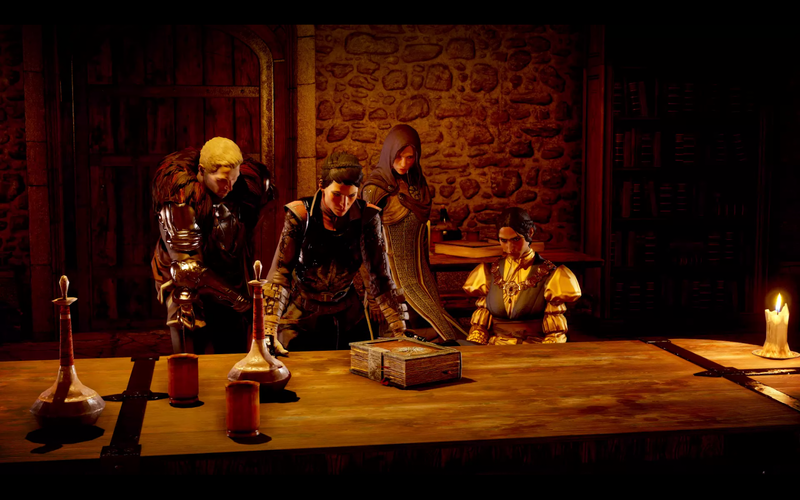 When Dragon Age: Inquisition begins, we question our companions. We wonder about the pale, quiet mage, Solas. The companionable dwarf, Varric. The fiery yet kind warrior Cassandra. We get to know our Companions quickly. But who are the advisors we find awaiting? Josie, Leliana, and Cullen? When DAI added advisors to the mix, our protagonists could flirt both at home as well as away. While dealing with consequences across the entire trilogy. In Dragon Age: Inquisition, we're provided with a diverse and lovable assortment of rogues, mages and warriors—nine companions who are brave potential friends, enemies, and lovers—along with three advisors (two of which are romanceable) who stay back from the fray and provide their wisdom and insights. My favorite thing about Inquisition's formula is that it mixed up the "camp/home flirtations" formula of Origins and DA2 and gave it new life. As always a few companions weren't romanceable at all (excuse me while I shed a few tears over the lost yet fascinating potentialities of the might-have-been romances with Sten, Nathaniel, Varric, Aveline, and Viv, among others). But plenty were (and are). Then DAI added the advisors to the mix. Now our protagonists could flirt both at home as well as away. We weren't just pursuing friendships or romantic relationships with people who fought alongside us, but with people whose histories we knew (in the case of Cullen and Leliana), or who offered a new central role in connecting us to the world. The divisions between advisor and companion are interesting, and historically (at least, based on the paths in Dragon Age: Inquisition), in the next chapter of the game for Dragon Age 4, it looks like characters will move from companion to advisor once they've evolved and grown through a series of events or traumas, often witnessed firsthand by us, as with Leliana and Cullen. So let's examine how that formula works, first and foremost, in DAI, where the advisors tend to be quieter, more tired, battle-scarred, and for good reason. Look at Leliana and Cullen, for instance—we've known them across the trilogy. When we find Leliana again in Inquisition, she's still beautiful, but now the blossom is all steel through and through. When we first met Leliana, she was a devout, pretty and charming young woman—like a soft and lovely blossom with a hidden stalk of steel. One moment, she might be singing around the campfire or talking about her faith in the Maker, the next she'd be coolly talking about her life as a bard who was also a seductive assassin. By the end of Origins, Leliana's fate may range from violent death in the Temple of Sacred Ashes, to celebratory survival, to something in between. We next may have caught Leliana briefly in Dragon Age II, either on Tallis's mission, or in the final moments with Cassandra, which foreshadow the founding of the Inquisition. 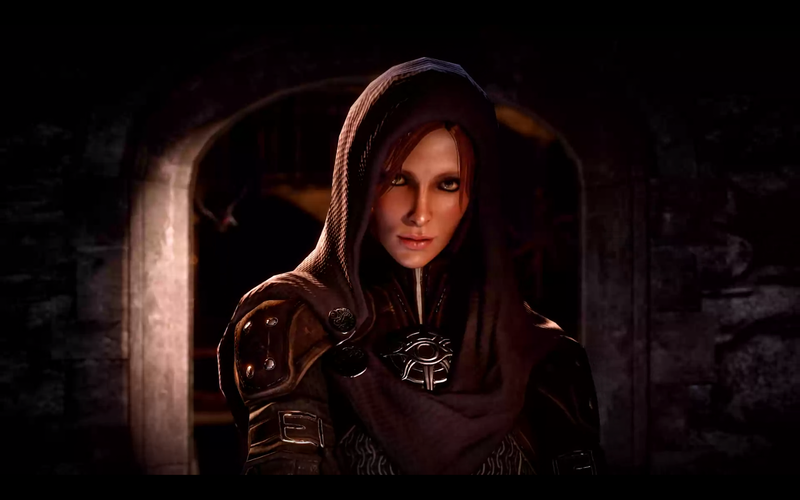 Then comes Inquisition, and Leliana is back (potentially even after violent death), and oh, how our girl has changed. She's still beautiful, but now the blossom is all steel through and through. She's no longer gregarious and chatty, and the veneer of sweet silliness is wholly gone, replaced by a calm, capable intensity. She's courteous and even kind, still with that charming and deceptively light voice (thanks to the nuanced voice work of the returning Corrine Kempa), but to say that Leliana is guarded and changed by the years is an understatement. As someone who loved her in Origins, I remember how shocked I was to see the forbidding, beautiful and slightly terrifying woman Leliana had become in Inquisition, although I was reassured a little during "Wicked Eyes and Wicked Hearts," when she was almost her old self, purring in the corner over fashion, shoes, and the machinations of the great Game. Although, I have to admit... that having supported the mages and played "In Hushed Whispers," I still wasn't entirely okay—because Leliana in that chapter of DAI is quite simply extraordinary. A wraith, a survivor, a living corpse... she is in this chapter of the story someone who is, terrifyingly, already dead. And she knows it. Even so, she's pure strength, pure vengeance, and pure faith. Yet even with a little tenderness intact in this brief nightmare future, Leliana has absolutely zero mercy left. No softness. Nothing left but the fire of retribution and belief. And then she burns both as she extinguishes herself and her life so that we can live... quoting the Chant in a purity that, strikingly, brought back the memory to me from Origins of the sweet, soft girl who'd once talked of the Maker and the rose. And even as we escape, she dies, without hesitation. She had just arrows enough (Sera would have understood). By the end of DAI, we can soothe Leliana and protect just a little of the remnant of that girl she was, saving a little of that softness and vulnerability. Or we can 'harden' her (meaning, we support her colder, more merciless side), making her more ruthless than ever as DAI concludes. Until "Trespasser" and its decidedly mixed outcomes. Until she may be a resolute member of the new team within the ashes, deep beneath Haven... or she may fly away on the wings of the lyrium magic that once brought her back to life. DAI gives us a new and introspective Cullen, now an advisor. Cullen's advice is strict, often militaristic, but not extreme (unlike darling Murder Nun Leliana). He's not cruel, just straightforward, as if he's tired of games. 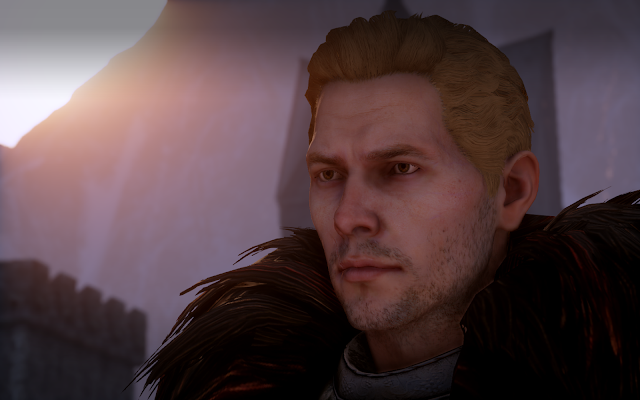 Unquestionably one of the most popular characters across Dragon Age, Cullen began his journey in Dragon Age: Origins as a naive Templar (who may or may not have had a shy and innocent crush on a Circle Mage Warden). By the end of DAO, however, young Cullen's been tortured, traumatized, and disillusioned. He may even have supported the wholesale slaughter of the Kinloch Hold mages in the Right of Annulment. Rumors at the end of DAO (ultimately proven false) imply that Cullen went mad and then went on a killing spree. But rumors are cheap, and we eventually learn that he simply took a sabbatical, recovered from his experiences, and then continued his commitment to the Templars. At least in the short term. But at least for a few moments, Cullen took a respite from the world. Until Dragon Age II begins, when a sadder, wiser Cullen is now installed at the worst and most corrupt circle in Kirkwall, and you can't spit without hitting a secret blood mage. Poor Cullen. Talk about the opposite of a corrective experience! He's more beautiful here, golden-haired and pale, a Templar archangel, but he's also red-eyed and haunted, shadowed, as if he hasn't slept in millennia. And then we see him again in DAI, and helloooo Cullen, because, dude. He's obviously recovered from Kirkwall by attending the same spa as Flemeth before DA2, because he looks utterly amazing. The only throughline? The poor guy still looks like he hasn't slept (and as a diehard mage rights supporter, even as a happy Cullenmancer, I admit that I didn't entirely mind, at least at first). Regardless, DAI gives us a genuinely new and introspective Cullen, now installed, like Leliana, as an advisor. Cullen's advice is strict, often militaristic, but not extreme (unlike darling Murder Nun Leliana). He's not cruel, just straightforward, as if he's tired of games. He is in fact cautious with himself and others. Most of all, he simply seems tired. Tired of ordering soldiers to their deaths, tired of his own fears and traumas, tired of magic, tired of tyrants and corruption. 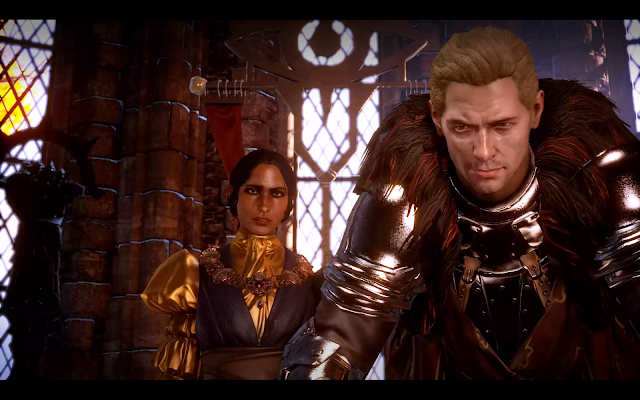 Which is why Cullen's poignant, quiet romance actually I think works best with him as advisor. Cullen at that point is simply exhausted, cynical, and old while he's still young. 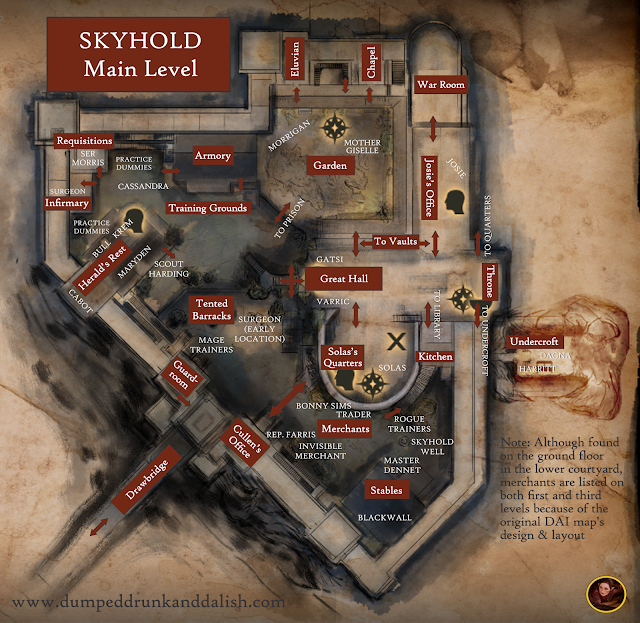 He's still a talented warrior, a skilled Commander, but all of that has begun to pale for him—not least because of the guilt he carries, for both Kinloch Hold, and for Kirkwall. Ultimately, Cullen and Leliana are both moving and effective in these new DAI advisor roles in different ways because they are advisors. They're not fellow warriors, or party mates. They're back at home, trapped and moving the chesspieces—both hating and loving that fact. Because... they have left the fray. Because they have, at some point, understandably tired of those who simply spent lives and ordered soldiers into battle to die where they needed them to. Because, in some ways, life hasn't precisely defeated them, but it has taught them harsh lessons. They have learned to fear... not just others—not just war, or Blight, or famine... but themselves most of all. At her heart, Josie's just... kind. Not cruel. She believes she's working for the greater good. She believes in statesmanship versus violence. She believes in words, not warfare. She believes in a peaceful solution. As our intrepid Ambassador, Josephine's a contradiction on many levels. 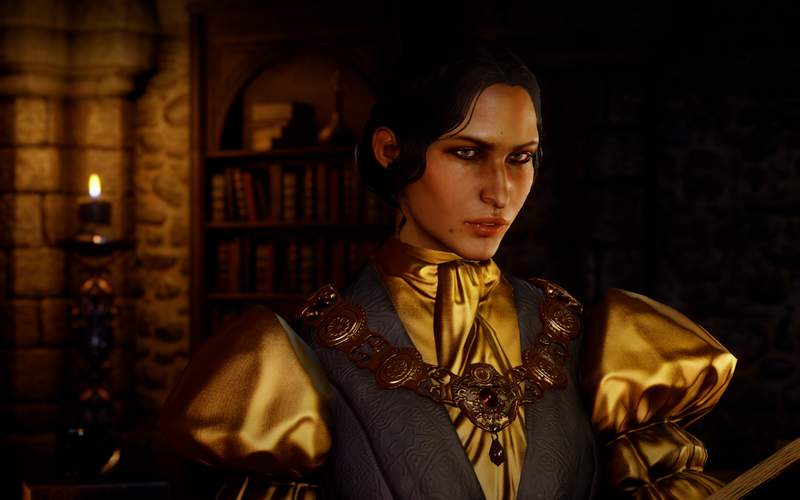 At first glance, my initial impulse when meeting beautiful Josephine Montilyet in DAI is always simply to get her out of there, to protect her. When set against Cullen's stoic Commander or Leliana's ruthlessness, Josephine seems like an impossible combination, a hare among the beasts. And then I reevaluate that impulse, when Josie shows herself to be flintier and tougher than she first appears. My favorite thing about Josie, aside from the gentleness that is truly a part of her, is that she may seem weak but she's not remotely so. She is aware of human cruelty and weakness; she sees it, open-eyed and clearly, and she will act accordingly. And yet. She has reserved pieces of herself. She maintains a sense of hope, optimism and compassion. She truly believes that words can change the world. How can a writer not adore her? It's an important lesson: While Josie is gentle, she is not weak. Compassion does not remove her ability to judge swiftly and fairly when the need arises. LELIANA: I can send in some assassins. CULLEN: I'm sure the troops would be effective. But as sweet as Josie is, she understands the brutality of Thedas, as we quickly discover. One of my favorite moments in DAI is when my Inquisitor, new to Skyhold, walks its main hall for the first time. Even in shambles, the place is grand, beautiful, filled with the possibilities of cathedral arches and new beginnings. 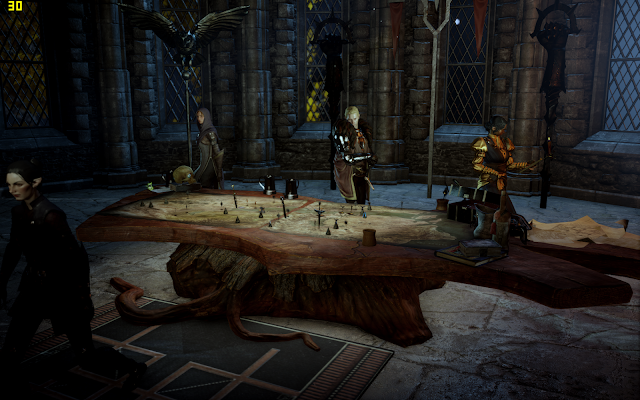 JOSEPHINE: [This] is where the Inquisition will sit in judgment. Where you will sit in judgment. At your leisure, Inquisitor. The throne will wait until you are ready. INQUISITOR (among options): Do I really need to oversee even more death? I'm nearly at capacity. JOSEPHINE: Justice has many tools. If their application is clever, execution may even seem merciful by comparison. Josie is showing her statecraft here, her toughness. She may be sweet and charming, but she's a noble. A bard. She's seen enough diplomacy, death and judgment to know that death is not the worst outcome. I loved this. Josie, arguing for execution and death as mercy. It's unexpected, a bit shocking, and... well, it's also part of being a bard. They learn expedience young. Expedience and gamesmanship. But it's more than that, I think. Truly. At her heart, Josie's just... not cruel. She believes she's working for the greater good. She believes in statesmanship versus violence. She believes in words, not warfare. She believes in a peaceful solution. And it's why her romance is beautifully envisioned not just as pansexual but as (arguably) asexual. She doesn't judge for race or gender. She just wants comfort. A fabulous, wholly sweet kiss (complete with leg-pop) worthy of a Disney cartoon. Sweet, restful, appreciative moments before the fire. No pressure for more. No pressure, anywhere. She takes care of an entire family and its ancient hopes, and she does it because it's kind. And right. And while doing so, she appreciates whatever moments in life she gets. She's seen enough of the world to know what a gift that is. That's Josie. She's sweet and vulnerable enough to hope for love... and flinty enough to know that it doesn't solve anything. So it makes perfect sense when you think about it. When it comes to our advisors, these people have all evolved, suffered, and (some more easily than others) arrived at a way to live with themselves. Which brings me to their DAI fates and outcomes. "How do we live with ourselves?" Both Leliana and Cullen ask this pretty blatantly throughout Inquisition... Even in the end, the answer's not clear. What Dragon Age: Inquisition does with the characters who become our advisors is almost diabolical in its complexity to me, and in the best way. It's subtle but it's brutal. Why? Because it asks us to examine the toll of negotiation and politics on those who participate. What happens to those who tire of the Game? What happens to a Commander who is no longer willing to send his people into battle on his behalf? Who no longer even believes in the order to which he once pledged his life and body? What happens to a bard who once killed with seductive kindness in the shadows, when she loses her taste for blood? Ultimately, the subtle throughline is there, the lingering eternal question: Not just what do they do, how do they survive, but... how do they live with themselves? Both Leliana and Cullen ask this pretty blatantly throughout Inquisition. They're both tired, traumatized, dedicated to duty, and colder than they'd like. They have no more answers now than a decade past. And yet they cannot help but ask. They're just older. Tougher. More willing to weigh lives. More willing to judge themselves when they fail. And, of course, it still won't bring anyone back. And so. For me, this is where Josie comes in and proves her worth. When it comes to battle fatigue, Josie's not on the same level as Cullen, or at the same level as Leliana. But I believe she's not meant to be Leliana's equal; she's her spiritual daughter. For Leliana, I believe, Josie is the true diplomat, the ambassador, the perfect bard—the one who still regrets the moment of the kill. Josie's not despairing like Cullen, or cold like Leliana. Their edges are honed, their boundaries forged. Josie's the one they want to save. The one they think can do what they do without losing sleep (or, well... much). It's not easy giving advice. Much less receiving it. Luckily, they have Josie. Who, thanks to her talents in playing with dolls, can envision scenarios. Work out treaties. Figure out fabulous, impeccably costumed, and peaceful solutions. While still believing people can be mostly good at heart. And that's what I'll bet on, going into DA4. Josie and her humanity. Josie and her dolls. Josie, who still believes in peace—and not a Blighted Doll Apocalypse. I think this is ultimately the key to the roles of our advisors in Inquisition; I think it's why Leliana brought Josie into the fray, even as a slightly vulnerable and less experienced bard—and why she continues to protect her. Only those without it understand the value of real goodness and innocence; how innocence can save us all. Thank you so much, Laine! I so appreciate the praise, but even more that you're reading and commenting here -- I love hearing feedback and thoughts! And I'm with you -- cannot WAIT for DA4! I just found your blog, and was very happily surprised to see that it is still active! What a joy! I absolutely love your in-depth and insightful analyses, and I appreciate you taking the time to write them out a share them with the world. Keep it up - I will certainly be eagerly awaiting more! Hannah, thanks so much -- and I'm so delighted you're reading! I'm so grateful that you're enjoying the blog, and hope you will keep going as I forge my way through all the games and characters. Please do keep sharing your thoughts and feedback!